After traveling four hours from home on Sunday May 20th 2012 to view the annular eclipse, you can officially say that we are now "Eclipse Chasers"! We traveled to the "Eclipse Hot Spot" of Kanarraville, UT for our chance to see the "Ring Of Fire" that occurs in an annular eclipse. An open field was designated as the prime viewing spot. Not only was our view of the eclipse spectacular from being in the "hot spot", but because of all the knowledgeable and friendly people that surrounded us. We met other "eclipse chasers" that traveled from all over the United States. 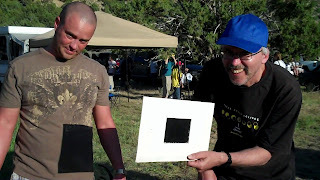 Some were first time chasers like us, and others had been all over the world viewing eclipses. One of our favorite people we met was Reiner Euler, who traveled from Giessen, Germany to the little town of Kanarraville, UT to watch this rare event. "I have seen two total eclipses, one in Germany and one in Turkey, and one annular eclipse in Madrid," said Euler. "This is the second annular eclipse." Not only did Euler have high-tech telescopes, binoculars and cameras, but he also showed us how to use a pinhole projector to view the eclipse. Chad got to have the eclipse broadcast right from his t-shirt! Euler watched his telescope monitor for the sign of the "first contact" and alerted everybody around him that it had begun. This being our first eclipse, it would not have been the same had we watched from somewhere else! Thanks for sharing! We went down to Bryce Canyon and the Astonomy Festival there. It was amazing to be there with my husband and our four little ones, along with people from ALL over the world. When the eclipse was full there was a cheer from the large crowd. It was very exciting!